The house was formerly the Doctor's surgery and living accommodation. The size and layout of the accommodation could easily accommodate extended family or convert into house and gîte. There are currently 4 B&B rooms which are let at 50€ per night per room. Viewing is highly recommended. 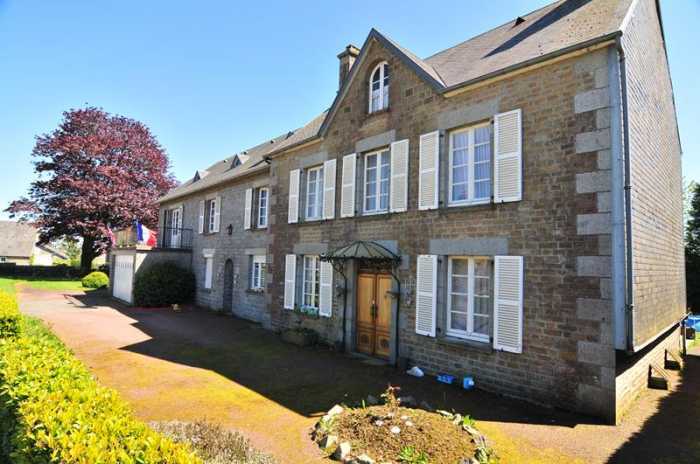 The property is situated in the small town of Ger (with all every day amenities) and with easy access to the historic market town of Mortain. Mortain is a thriving market town where excellent shopping facilities, restaurants and bars are available. It is situated in the southwest of Normandy, near the borders of Manche and Calvados. The beaches on the west coast are an hour's drive away and the property is approximately 80 minutes drive from the port of Caen and an hour and forty minutes from Cherbourg. A little further afield are the D-Day landing beaches and the Mont St Michel. The Lac de la Dathée, ideal for walking, fishing and boating, and an 18 hole golf course are within 20 minutes drive, as is the Saint Sever forest. Entrance Hall 7.03 x 1.65m Double doors to north and small pane glazed door to terrace and south elevations. Stairs to first floor. Tiled floor. Radiator. Telephone socket. Lounge 7.03 x 3.49m Window to front and rear elevations. Parquet flooring. 2 radiators. Telephone socket. Dining Room 7.03 x 3.41m 2 radiators. Window to front and rear elevations. Tiled floor. Telephone socket. Serving hatch to kitchen. Utility Room 3.15 x 3.09m Hot water cylinder. Hand basin. Tiled floor. Partly glazed door and side panel to conservatory. Radiator. Kitchen 3.28 x 3.08m Window to rear elevation. Tiled floor and partly tiled walls. Stainless steel sinks with mixer tap. Range of base and wall units. Worktops. Space and plumbing for dishwasher. Space for free standing fridge and freezer. Space for free standing cooker with extractor over. Cupboard housing electrics. Conservatory 8.70 x 1.44m Glazed roof. Door to garden. Second Entrance Hall Glazed door to north elevation. Tiled floor. Built-in cupboards and shelving. Window to conservatory. Radiator. Shower Room 2.39 x 2.20m Shower. WC. Partly tiled walls. Tiled floor. Vent. Partly glazed door to conservatory. Vanity unit. Large upright radiator. Bedroom 1 3.66 x 3.28m Window to north elevation. Radiator. Dining Room/Study 5.02 x 3.87m Window to east elevation. Tiled floor. Radiator. Door to garage. Landing Window to front and rear elevations. Stairs to second floor loft (could be converted to provide additional accommodation if required). Wood flooring. Bedroom 2 3.50 x 3.49m Window to south elevation. Radiator. Wood flooring. Hand basin. Bedroom 3 3.50 x 3.48m Window to north elevation. Radiator. Bedroom 4 3.91 x 3.45m Window to north elevation. Radiator. Built-in wardrobes. Wood flooring. Inner Landing Tiled floor. Window to south elevation. 2 radiators. Built-in cupboards to one wall. Bathroom 2.24 x 2.06m Radiator. Tiled floor. Partly tiled walls. Pedestal basin. Bidet. Bath with mixer tap/shower fitment. Bedroom 5 4.65 x 4.17m Window to north elevation. Radiator. Built-in cupboard. Bedroom 7 7.03 x 5.06m 2 windows to east elevation. 2 radiators. Partly glazed doors and side panels to balcony. Central heating thermostat. (Access also from second staircase). Loft Storage Room Wood flooring. Sloping ceiling. Wrought iron double gates and pedestrian gate gives access to gravel drive and vehicular from the road to the side of the property. Integral Double Garage with sliding wooden door. The front garden is laid to lawn with walled terrace and gravel seating area. Vegetable garden. Chicken run. Small detached garden store. Mature hedges and flower borders. Integral Double Garage with sliding wooden door. Utility Room 2.90 x 2.80m Sink. Space and plumbing for washing machine and dryer. Window to east elevation. Door to garden. Store room 1.97 x 1.67m. Partial Basement with Wine Store. Boiler Room with boiler and oil storage tank. Mains drainage, water, telephone and electricity are connected. Oil fired central heating. Broadband internet connection.